The root rot caused by Phytophthora medicaginis is a major disease of chickpea in Australia. Grain yield loss of 50 to 70% due to the disease was noted in the farmers’ fields and in the experimental plots, respectively. To overcome the problem, resistant single plants were selected from the National Chickpea Multi Environment Trials (NCMET)—Stage 3 (S3) of NCMET-S1 to S3, which were conducted in an artificially infected phytophthora screening field nursery in the Hermitage Research Station, Queensland. The inheritance of resistance of these selected resistant single plants were tested in the next generation in three different trials, (1) at seedling stage in a shade house during the off-season, (2) as bulked single plants and (3) as individual single plants in the disease screening filed nursery during the next season. The results of the tests showed that many of the selected single plants had higher level of resistance and seed yield (P < 0.05) than the best resistant cultivars used as checks. The single plants with bidirectional expression of anthocyanin pigment, both at the shoot apex and at the base of stem, showed higher level of resistance than plants without it. The results also indicated certain level of heterozygosity-induced heterogeneity, which could cause higher levels of susceptibility, if the selected single plants were not screened further for the disease resistance in advanced generation/s. The genetics of resistance to PRR disease was confirmed as quantitative in nature. Chickpea is an important cash crop of Australia, grown during winter for its grain and agronomic value. Phytophthora root rot (PRR) disease is caused by the oomycete pathogen Phytophthora medicaginis and it is an important chickpea biotic production constraint in Australia. No viable control measure exists for PRR disease. Ecologically, the least preferred chemical control using Metalaxyl is only partly effective (Rhodes and Mayer 1989). A bio-control using endophytic actinobacteria that was reported by Misk and Christopher (2011) was only in the early stages of development. The PRR is most prevalent under cool, prolonged wet conditions and in waterlogged soils. Yield losses due to the disease have been observed from 50% in farmers’ fields (Knights et al. 2008) to 70% in the HRS field experimental plots during 2009. The symptoms include yellowing of lower leaves defoliation from the ground upwards and/or wilting of entire plants, decay of lateral and tap roots, and dark brown to black tap root lesions sometimes extending above ground level (Vock et al. 1980). The peak of disease symptoms appears generally after flowering or podding stage. As breeding resistant varieties is the most efficient means to overcome the disease problem, the resistance-breeding work by the national chickpea improvement program identified one variety—CPI 56564 (ICC 11870), which had resistance at low, moderate and severe disease conditions. The released varieties developed from this, like Barwon, Norwin, Jimbour, Moti, Yorker, and Kyabra showed only moderate level of resistance (Brinsmead et al. 1985). The high level of resistance revealed in wild species like Cicer echinopermum, C. reticulatum and C. judaicum, were incorporated in the present national breeding program (Knights et al. 2008). The National Pulse Development Program (NPDP) evaluated chickpea genotypes for PRR disease resistance in field nursery that were infected with nine strains, namely 4019, 4021, 4026, 4027, 4046, 4065, 4091, 1129-1 and 943 c-1, of the pathogen every season, as part of the national chickpea multi-environment trials (NCMET). These strains were collected from chickpea and lucerne (an alternate host of the pathogen) fields. A large variation in pathogenicity among four strains of the nine was reported later (Du et al. (2013). The information on the strains and inoculation methods used in NCMET were shown in the next section of this article. The above national screening trials were conducted over three successive years as stage one to three (NCMET—S1 to S3) using advanced generation lines (F5 to F8) originating from single seed descents. These single seed descents that originated from the hybrids of above root rot disease resistant genotypes and high yielding popular cultivars of Australia. As per the national chickpea breeding project specification and framework, samples of each F4 progeny and advanced breeding lines (F5 to F8), which originated from single seed descent selection and samples of all genotypes from multi-environment yield trials (MET) were screened in three cycles in the PRR nursery (NCMET S1 to S3) at the research station every season. It appears that these genotypes from single seed descend selection were promoted to NCMET with the unstated hope that the disease was controlled by one single gene. Whole plot scoring was practiced in NCMET for identifying the resistant entry and the trial was discarded after scoring. The national program promoted genotypes, which had the disease resistant score that was equal or better than that of the standard resistant check variety Jimbour. The varieties grown in farmer’s fields, after screening in PRR nursery, had only moderate level of resistance. However, there were many resistant plants in many plots of the trail/s. The vigorous growth and seed yield of these resistant plants inspired the author to select single plants and test their inheritance of resistance in the breeding program. Crop plant disease resistance is often classified as qualitative and quantitative resistance (Vander plank 2012). The qualitative disease resistance is generally regulated by a single resistance (R) gene, where a classic gene-for-gene mechanism operates, and the inheritance is said to be qualitative or Mendelian. In contrast, many genes of small cumulative effect usually regulate quantitative resistance and the inheritance is stated as quantitative or polygenic (Parlevliet 2002). However, the separation between these two classifications of disease resistance is not clear-cut (Poland et al. 2009). In many crop plants, disease resistance varies from effects of single gene; dominant or recessive to many genes, polygenic or quantitative genes. For an example, resistance to Ascochyta blight in chickpea is controlled by single dominant gene, digenic to quantitative genes depending on the race of pathogen and the cultivar used to study the inheritance of resistance (Sharma and Ghosh 2016). Du et al. (2013) discovered differential pathogenicity among four isolates of the pathogen (4019, 4021, 4027 and 4046) on three chickpea varieties (Jimbour, Flipper and Yorker). They also screened 16 chickpea genotypes including Yorker and Jimbour derived from crosses involving wild species, using the most aggressive isolate of P. medicaginis—4027. They concluded that there was no chickpea genotype, which was highly resistant to the PRR. They indicated that the variable level of resistance existed among cultivars may be combined in breeding programs. Plett et al. (2016) reported that “Chickpea varieties with improved resistance to Phytophthora also displayed lower colonization by rhizobial bacteria and mycorrhizal fungi, would lead to an increased reliance on N and P from soil”. Flavonoids are plant secondary metabolites that contribute to the adaptation of plants to biotic (Dixon 2001; Liu et al. 2013) and abiotic stresses tolerance (Smile and Hetherington 1999). 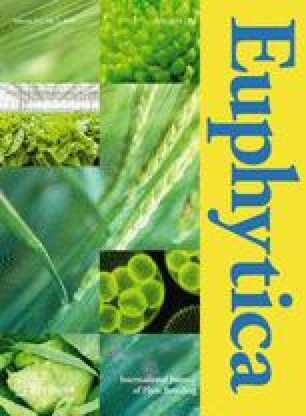 The role of anthocyanin pigmentation, a major flavonoid compound, in biotic and abiotic stress tolerance of crop plants were reported by Nicholson and Hammerschmidt (1992), Wegulo et al. (1998), Kolkman and Kelly (2000), Steyn et al. (2002), Treutter (2006), Li et al. (2009), Bovy et al. (2007), Maddox et al. (2010), Liu et al. (2013), Bodah Eliane (2014), Rosado-Álvarez et al. (2014) and Lu et al. (2017). The genes controlling the production of this metabolite have been used in Biotechnology to alter important agronomic traits, such as flower and fruit colour, resistance and nutritional value. The advances made in engineering the flavonoid pathway in tomato (Solanum lycopersicum) was examined by Bovy et al. (2007). Liu et al. (2013) reviewed the abiotic and biotic stress response of flavonoids in cereal crops, Maddox et al. (2010) against bacterial phytopathogen Xylella fastidiosa, under in vitro agar dilution assay conditions. Antifungal properties of plant extract rich in flavonoid compounds were reported by Rosado-Álvarez et al. (2014) for the first time. The mechanism involved in the pathogenesis of PRR and the genes involved were characterised for some species. The infection took place through direct penetration at root level (Walton 1994; Tyler 2007). Götesson et al. (2002) identified up to 19-member gene family of endopolygalacturonase in Phytophthora cinnamomi. However, genomic level studies during the early stages (2–4 h) of infection of phytophthora in soybean activated more than 195 genes (Narayanan et al. 2009) and eight Quantitative Trait Loci (QTL) for PRR tolerance (Li et al. 2010). In many crops, single plant selection for various traits were very effective over other methods of selection, purely due to genetic reasons. Single plant selection was utilized effectively for seed yield in wheat (Thakare and Qualset 1978) and in durum wheat (Mitchell et al. 1982), for seed yield in lentil for organic farming environment (Vlachostergios et al. 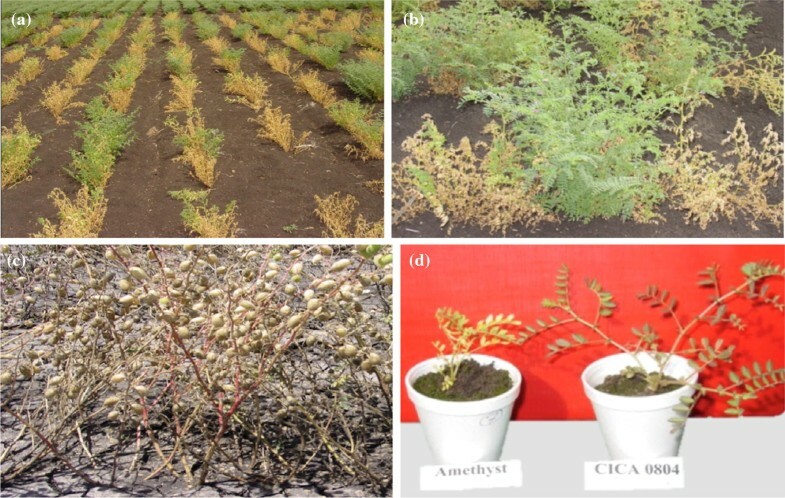 2011), for Fusarium wilt disease resistance in chickpea (Haji-Allahverdipoor et al. 2011), for resistance (Shaikh et al. 2013) against Anthracnose (Collitotrichum truncatum) of lentils (Lens culinaries) and against number of diseases in tomato (Hanson et al. 2016), which included yellow leaf curl disease (begomoviruses), late blight (Phytophthora infestans), bacterial wilt (Ralstonia solanacearum) gray leaf spot (Stemphyllium spp. ), Fusarium oxysporum f. sp. lycopersici race 2 and Tobacco mosaic virus. The objectives of this study were (1) to test the inheritance of disease resistance of the selected single plants from the PRR disease nursery, (2) to investigate the possible cause of high levels of disease susceptibility over generations (3) to study the conceivable effectiveness of single plant selection for stable resistance and yield over successive farming. The materials for this investigation were the seeds of single plants that were found resistant to the Phytophthora root rot disease in the plots (Figs. 1, 2) of a NCMET-S3. Such trials (NCMET-S1 to S3) were conducted in the artificially infected field nursery of Hermitage Research Station (HRS), Queensland every season. 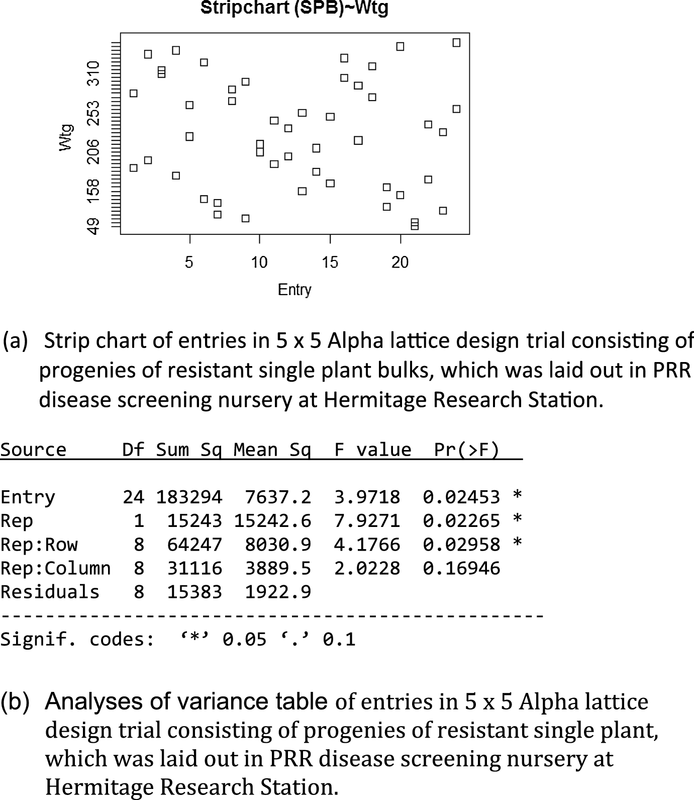 The NCMET-S3 was planted in the artificially infected field nursery in a Row Column Design (Alpha lattice) consisting of 25 test entries including 5 checks in 1-m row plots. The row spacing was 67 cm. Twenty-five seeds were planted per row. The seeds were inoculated with a mixture of nine strains of P. medicaginis at the rate of ≈ 10, 000 oospores/seed applied in slurry, at the time of planting*. A device attached with the tractor, coated each seed with the homogenised mixture of media (slurry) containing the nine strains of the pathogen, while falling from the seed tray. The nine strains were—4019, 4021, 4026, 4027, 4046, 4065, 4091, 1129-1 and 943 c-1. These strains were cultured and inoculated every season in collaboration with the Department of Primary Industries (DPI) New South Wales and DAFF, Queensland. The trial was flood irrigated during flowering to enhance the spread of the pathogen in the field (Figs. 1, 2). The standard cultural and plant protection practices were implemented when required. (Note: A detailed information about the strains, spore production technique and concentrations, may be obtained from Phytophthora Officer in the Department of Agriculture, New South Wales Australia). Many resistant plants were noticed in the plots of disease nursery by end the season’s NCMET-S3 trial (Figs. 2, 3). The resistant single plants were selected based on the pod number and healthy tap root system that was assessed after pulling the plants out of the soil, which was saturated with water (as there was heavy rain). The inheritance of resistance to the disease was tested by growing the seeds of the selected disease resistant plants during off-season in a shade house and in the field screening studies during the next season. The inheritance of the disease resistance was first tested on seedlings in the shade house. Three-day-old germinated chickpea seeds were planted at the rate of one seedling per 50 mL Styrofoam cup containing the P. medicaginis infected soil (Fig. 4), which was expected to have sufficient inoculum load to cause infection. This soil was collected at random from the disease nursery at root depth, soon after (within 30 days) the season and thoroughly mixed before using for this test. The field soil was considered as a source of virulent pathogen to infect the test plants because the field nursery was inoculated every season with the nine strains of the pathogen and the propagules of the pathogen had the ability to survive in the field soil for many months (Stack and Miller 1985) to 3–4 years (Manning et al. 2000). The 50 mL Styrofoam cups were perforated with a hole at the centre of the base and two triangular cuts on sides of the base to facilitate easy water movement from a two-inch pan. Five styrofoam cups for five replications of a treatment were placed in each pot base pan. The soil was saturated with the water from the pan throughout the experiment (3 weeks). The seeds of selected five single plants with a susceptible check, Amethyst (Fig. 4) and a standard resistant check, Jimbour were tested in the test design. A randomised design was used for the five treatments. The five treatments with five replications were repeated three times. The disease symptoms of entries in the tests were visually confirmed with photographs and descriptors, mentioned earlier in this section as described by Vock et al. (1980). The first field experiment comprised of seeds from 18 single plant bulks and seven cultivars as checks. As seeds from many selected single plants were not enough for a replicated field trial, the seeds from the selected single plants were bulked according to the family of origin. Only the single plants with similar morphological traits like seed shape, size and colour were considered for bulking to form an entry for the first field experiment. These bulks originated from 10 genotypes developed from crosses involving phytophthora resistant parents. This experiment was laid out in a 5 × 5 Row Column (Latinised Alpha Lattice) design in 1-m four row plots with two replications, each row was planted with 25 seeds and the row spacing was 67 cm. The randomization for the 5 × 5 row column design is shown in “Appendix 1”. The second field trial was made up of seeds of 46 resistant single plants and three cultivars as checks. These single plant entries originated from 17 parental genotypes derived from crosses involving resistant parent. These were laid out in a 7 × 7 Row Column (Latinised Alpha Lattice) design in 1-m two row plots with two replications, each row was planted with 25 seeds and the row spacing was 67 cm. The randomization for the 7 × 7 row column design is shown in “Appendix 3”. The seeds of the above two trials were inoculated with the same nine strains of the pathogen, exactly the way the NCMET-S3 were inoculated, as mentioned above in the second paragraph of this Materials and Method section. The following general statistical model for response plot yield (considered as non-orthogonal) and disease scores after transformation (non-orthogonal) were analysed in the SAS or R programs. As per this model rows and columns considered as having random effects and the treatment considered as having fixed effects. where Yij = Observed disease susceptibility/grain yield, μ = Overall susceptibility/grain yield mean, ri = Row effect, cj = Column effect, pk(ij) = Replication variation, t k(ij) = Treatment variation and εij = Random unit variation –independently normally distributed with mean zero and variance σ2. In the seedling experiment, the susceptible check showed clear symptoms of the PRR infection. At the end of the experiment (23rd day), the number of plants without any PRR symptoms was counted as resistant and plants with the symptoms as susceptible. The differential expression patterns of anthocyanin of entries in the shade house were also counted and the percentage of expression pattern and correlations among anthocyanin expression pattern, disease resistance and susceptibility were calculated and presented. The anthocyanin expression patterns during differentiation and development of the plant included two types. The bidirectional expression included the appearance of pigments on the adaxial surface of mid rib of the apical leaf and on the base of the stem of the same plant, whereas mono-directional expression of the pigment included either on apical leaf or on the base of the stem of a plant. The disease susceptibility scores recorded from 1 to 9, where 1 = 1 to 10% of the plants showed symptoms of the disease as described by Vock et al. (1980), 2 = 11 to 20% of plants showed yellowing of lower leaves defoliation from the ground upwards and/or wilting of entire plants, 3 = 21 to 30% plants showed yellowing of lower leaves defoliation from the ground upwards and/or wilting of entire plants, and so on till 9 ≥ 80% of plants showed yellowing of lower leaves defoliation from the ground upwards and/or wilting of entire plants (Fig. 1a, b). The plots were scored after 6 weeks of growth in the field by assessing the visible symptoms, mostly wilted or dead (Fig. 1a, b), as mentioned in the second paragraph of this document’s introduction. The seed yield per plot recorded (g) for both field experiments (7 × 7 and 5 × 5), were analysed as per respective models shown above and presented here. The data on disease score of the field trials (5 × 5 and 7 × 7) were subjected to transformation (Arc sign) before analysis to meet the assumptions of the analysis. The final disease scores and the seed yields (g/plot) data from 5 × 5 and 7 × 7 Row Column (Alpha Lattice) design experiment were analysed as Row Column Alpha Design using SAS or R as per the model shown above. The test entries showed higher (P < 0.05) level of resistance and higher (P < 0.05) seed yield/plot than their respective controls in the separate tests. The results of the shade house trial are shown in a bar chart (Fig. 2). Many plants had red pigmentation (Anthocyanin) on base of the stem. Some plants had the pigment on the adaxial surface of the apical leaf and some plants had expressed the pigment on both parts of the plant. The number of plants that had anthocyanin expression in th plants were summarised in Table 1. The relationship between anthocyanin expression pattern and disease resistance was summarised in Table 2. The disease scores and plot yields (g) of the field experiments were shown in Tables 3 and 4. The strip chard, ANOVA and Heat maps for seed yield (g) were shown in “Appendices 2 and 4” and in Figs. 3 and 4 for the 5 × 5 and 7 × 7 field experiments respectively. The experimental designs showed the fixed row, column arrangements and the allocation of entries at random in each plot. Heat maps offered visual summary of information of the field experiment. It gave a two-dimensional representation of the data using colours. 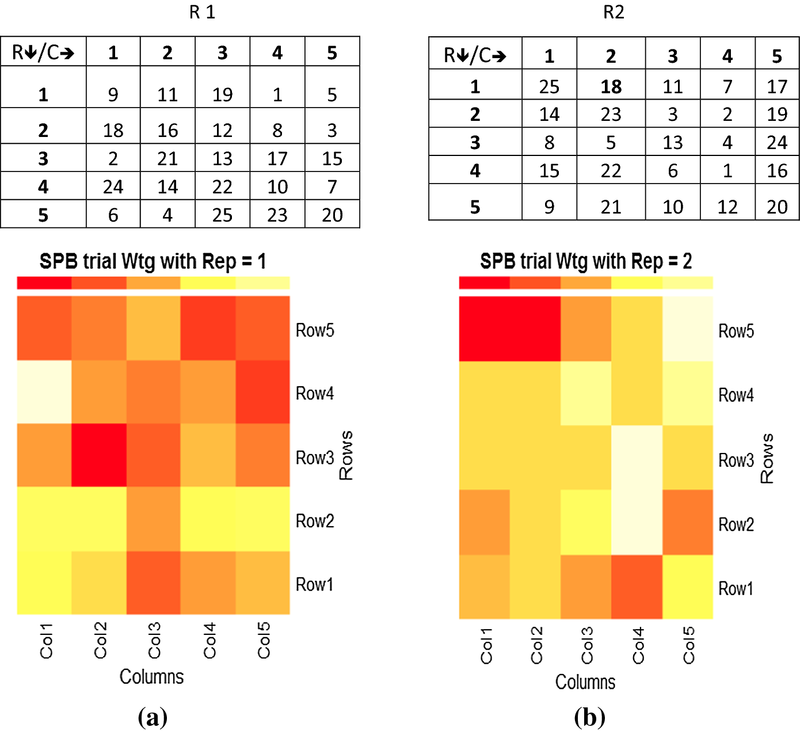 The heat map chart helped to visualize complex yield performance comparison of different genotypes across rows and columns and reps in this experiment. Here the darker colour was used for higher values and lighter colour for lower values. ANOVA summarised the analysis of variance for seed yield. The shade house tests consistently, showed the highest level of disease resistance in all except one test entry. The susceptible check Amethyst showed clear disease symptoms (Fig. 1d), which confirmed that the pathogen was present, virulent and the inoculum density required for infection was sufficient in the medium used. Both resistance and susceptibility were evaluated based on the visual symptoms as described by Vock et al. (1980), which were mentioned in the earlier sections of this document. 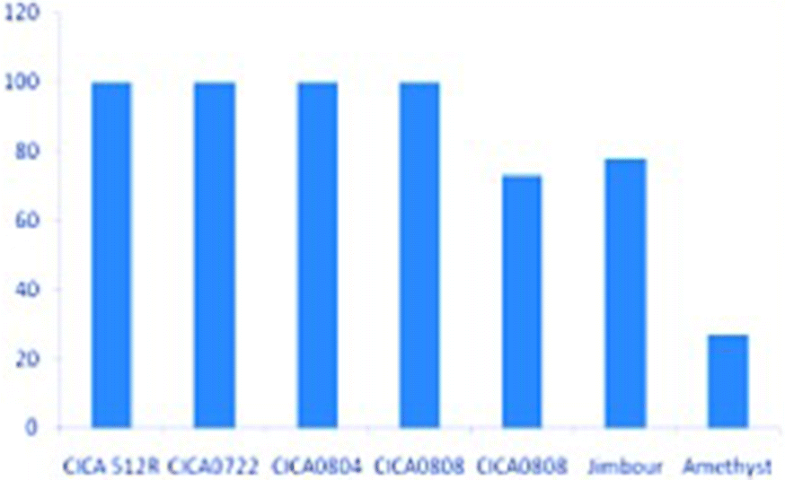 Among the five test entries, genotypes, CICA512R, CICA722, CICA804, CICA807 showed 100% mean resistance (Fig. 2). Whereas CICA808 showed 73% mean resistance, when compared to Jimbour with 78% and Amethyst 27% mean resistance to the disease, at the end of the seedling test (Fig. 2). The survival percentage of the susceptible check, Amethyst was significantly lower (P < 0.05) than all test entries of the shade house test, and it consistently displayed disease symptoms in all the three replications, which indicated that the soil from PRR screening nursery had virulent pathogens with sufficient spore density to infect the susceptible varieties and the last test was valid. The plants that revealed bidirectional expression of the anthocyanin pigment, that was on the adaxial surface of mid rib of the apical leaf and on the base of the stem, seemed to have highest level of resistance, compared to plants with mono-directional expression (either at the base of the stem or on the adaxial surface of the apical leaf) of the pigment. The preliminary data on the expression pattern of anthocyanin pigment was recorded and presented here in Table 1 and their correlation with disease resistance are shown in Table 2. All the test entries (18) of the bulked single plant trial (5 × 5) showed significantly higher (P < 0.05) disease resistance than the standard susceptible check Amethyst (Table 3). Three test entries (5) CICA0801-4, (10) CICA0807-1 and (12) CICA0807-3, indicated equal or significantly higher (P < 0.05) level of resistance than the standard resistant control variety (entry 22) Jimbour. The control Yorker (entry 20) tend to perform better than the standard resistant check with a score of 2.2 and a yield of 266.5 g/plot than the best resistant check Jimbour (entry 22) which had a 3.1 score and 213.5 g/plot. The mean disease scores ranged from 1.0 for Cicer reticulatum (entry 25) to 6.3 for the susceptible check, Amethyst (entry 21) in the single plant bulked (5 × 5) test (Table 4). When plot yield was considered, the highest (P < 0.05) seed yield was 319 g for the entry 16, CICA0812-2, which ranked 1 with a disease score of 2.5 and the lowest seed yield was 50.5 g for the entry 21, Amethyst ranked 24th. The seed yield of entry 25, Cicer reticulatum could not be assessed due to its requirement for long duration for flowering. The 18 test entries of 5 × 5 Alpha lattice trial originated from 10 families (breeding lines from same cross). The family members ranged from one to four test entries (Table 3). The family of CICA0801, consisting of four members, recorded the highest family mean plot yield (277.25 ± 13.77 g/plot). It also included two highest yielding test entries of the trial. All the entries in this family showed good resistance to the disease in the field screening and they were 2.3, 2.2, 2.2 and 1.7 (Table 3). The family of CICA0807 consisting of four members recorded the lowest family mean plot yield (215.25 ± 5.07 g/plot). Surprisingly, all the members of this family showed good resistance to the disease in the field screening trial, with scores of 1.6, 3.0, 1.7 and 1.8 (Table 3). The entry CICA0805 of the single plant bulks trial recorded the highest resistance score of 1.2 among test entries with an average plot yield of 276 g/plot, which ranked 7th among 25 test entries. The disease scores of common genotypes over 3 years of testing, under similar conditions of testing were also examined. This was summarised in Fig. 5a, b for 5 × 5 and 7 × 7, which had common entries with previous two seasons. This comparison, even though farfetched, indicated that the single plants selection reduced the disease susceptibility considerably, when compared to the plants from whole plot selection (Fig. 5a, b) that was done in the previous two seasons. Among 46 test entries of the 7 × 7 trial, 42 of them inclined to have better resistance to the disease than the standard resistant check Jimbour. (Table 4). The 46 test entries originated from 17 families (breeding lines of same cross). The number of breeding lines within the families of the 7 × 7 trial, ranged from 1 to 12 test entries (Table 4). The mean disease scores ranged from 1 to 6.5 in this test (Table 4). The susceptible check, Amethyst’s score was 5.5 with 42nd rank for plot yield. The family of CICA0802, consisting of two members, recorded the highest family mean plot yield of 283.5 ± 26.16 g/plot among the 17 families. Both the entries in this family also showed highest resistance to the disease in the field screening with mean disease score of 2 (Table 4). The family CICA0512 consisting of four members recorded the lowest family mean plot yield of 67.13 ± 28.0 g/plot, which was surprisingly lower than the susceptible check yield (99.5 g/plot). However, the family members displayed higher level of resistance with a disease score of 4.5 ± 0.6, than standard check’s disease score of 5.5. While the independent comparisons between entries for plot yield was considered, there were 37 test entries, which yielded higher than (P < 0.05) the susceptible check Amethyst and 29 test entries, which yielded higher than (P < 0.05) the standard resistant check Jimbour. The only highest seed yielding entry was # 17- CICA 0812-2, which had 454 g/plot (1st rank). This yield was significantly (P < 0.05) higher than 23 other entries (Table 3). It had a mean disease score of 1.5. The entry 6—CIC0608-1 with highest resistance having a disease score of 1.0, yielded only 199.3 g/plot with 23rd rank for plot yield. However, it was significantly (P < 0.05) higher than the seed yield (153 g/plot) of the standard resistant check Jimbour. A comparison of common test entries evaluated in the previous two seasons and the corresponding single plant entries of 7 × 7 trials are given in Fig. 5b. The single plants selection reduced the disease susceptibility considerably, when compared to the entries that originated from whole plot screening of the previous two seasons. The high level of resistance and seed yield among the progenies of selected resistant single plants in relevant trials and the death of susceptible checks, confirmed that the selected resistant single plants were not escaped from the pathogenesis in the field trial (NCMET-Stage 3). These single plant progenies resisted the entry and/or proliferation of the pathogen in vivo. In all the three trails conducted, with the seeds of the selected single plants, the susceptible check consistently displayed the symptoms of the diseases as described by Vock et al. (1980). Many plants originated from the single plant selection also offered higher seed yield (P < 0.05) than the best resistant check, Jimbour in both field trials. These confirmed that the pathogen was virulent and the inoculation density was sufficient for all the trials conducted with the seeds of selected single plants. This also established that the three tests were valid, reproducible and justified. The fact that the disease resistance level of single plant selections was higher than that of whole plot selection, deserves for new selection approaches in resistance breeding. The relationship between anthocyanin and PRR resistance reported here was new in chickpeas. (Figure 1c and Tables 1, 2), which needed to be investigated further. Such protective roles of this pigment, both against plant diseases (Dixon 2001; Bovy et al. 2007) and physical stresses (Smillie and Hetherington 1999) were conveyed earlier. In addition, the role of this pigments was also reported, by Lu et al. (2017), Rosado-Álvarez et al. (2014), Liu et al. (2013), Maddox et al. (2010), Treutter (2006), Steyn et al. (2002) and Nicholson and Hammerschmidt (1992), in safeguarding the plant growth and development. Many breeders have used the pigmentation as a marker for disease resistance. Wegulo et al. (1998) and Li et al. (2009) effectively utilised pigmentation to screen soybean-breeding lines against white mould (Sclerotinia sclerotiorum), both in the laboratory and in the field conditions. Whereas Kolkman and Kelly (2000) used this in common bean against white mould. The pea (Pisum sativum L) breeders once considered that the pigmentation of flower was linked to resistance genes of Fusarium rot (Fusarium solani Mart.). However, when susceptibility was observed in a pigmented variety, the pea breeders narrowed down the phenotypic selection parameters to root disease severity and root dry weight (Bodah Eliane 2014). However, the possibility of association between differential expression of the pigment and resistance was not investigated. There is a need to establish the relationship between anthocyanin expression pattern and PRR resistance. If there is a strong relationship as indicated by this preliminary result and as established in many other crops, pyramiding of genes for anthocyanin expression can give good results for resistance. Single plant selection from the disease nursery will reduce the level of heterogeneity within population, as shown here (Figs. 3, 4), and eventually homogenous populations could be achieved. Induction of haploids and doubling chromosomes or production of double haploids of resistant single plants from early selection is another fast and efficient method to generate a homozygous resistant variety without compromising other good characters. True or complete resistance among plants that originated from a resistant single plant was expected at this stage of the breeding program, because the single plants were selected from NCMET-S3, which consisted of plants at F7 or F8 generation. The cleistogamy condition existed in chickpeas ensured self-pollination. The single seed descend selection ensured higher level of homozygosity. Irrespective of the above two processes, there was considerable differences in the disease scores among the entries in the two field trials (P > 0.05), which consisted the seeds of the selected resistant single plants. This indicated that there was the occurrence of new genetic recombinants from the selected single mother plant/s. This confirmed that some level of heterozygocity for resistance (Tables 3, 4) lasted or remained among the test entries of S1 to S3 trials. This could have been the possible cause of disease susceptibility over generations. Alternatively, it could be assumed that there were changes in the level of virulence of the pathogen or a combination of both caused the heterogeneity. Another remote possibility for heterogeneity for resistance was that there was a new pathogen in the soil, which upon infection showed similar symptoms to that of PRR, but no such pathogen was discovered so far. 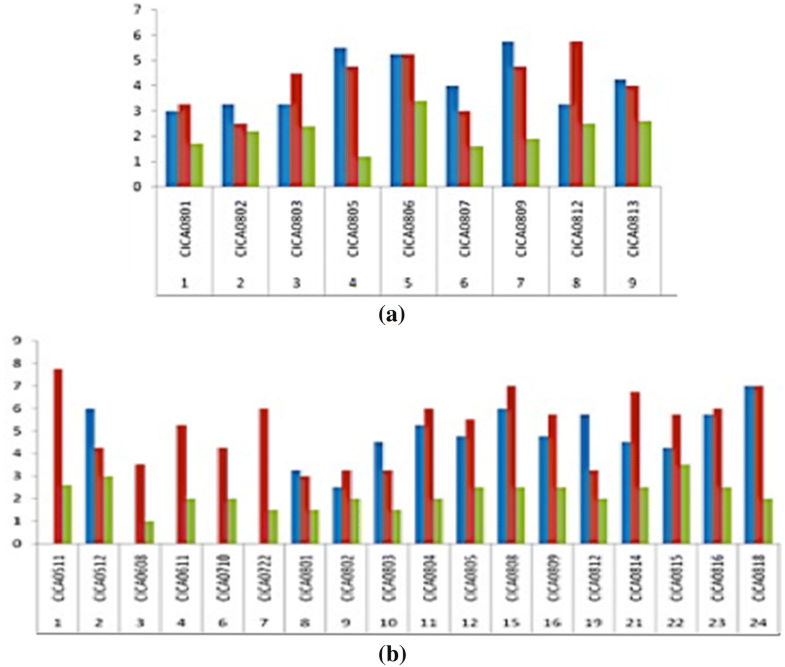 The comparison of common test entries that originated from whole plot selection (in the previous two seasons) and from single plant selection (of the third season), clearly indicated that the susceptibility score was brought down considerably among the single plant selections (Fig. 5a, b). In other words, the level of resistance was much higher in plots, where the plants originated from the single plant selection technique, when compared to plots, where the plants originated from whole plot selection technique. Even though the same person scored the trials in all three seasons and trials were conducted under similar conditions, this type of comparison from these trials may be bit far-fetched. The disease scores and plot yields within a group of entries originated from the same cross (entries 10 to 13) also varied significantly (P < 0.05), in the bulked single plant trial (5 × 5). It also differed noticeably (P > 0.05) within such groups of the single plant trials in 7 × 7 lattice design (Tables 3, 4). These variabilities within and between groups of entries confirmed that this substantial level of heterogeneity, for PRR resistance stemmed from the zygotic condition of the single plants. These single plants were specifically selected for the resistant character. Even though the association between the PRR scores and plot yield indicated general agreement for this single plant selection method (r = − 0.78 and − 0.63), there were large variability with in a group of plants originated from the same cross (families) of entries in both experiments as shown above. Any level of susceptibility (a score higher than one) in any entry (5 × 5 or 7 × 7) indicated that the formerly selected resistant single mother plant was a heterozygote and produced new recombinants with PRR resistant and susceptible segregates, which in turn influenced the plot yield. In other words, the heterogeneity within a plot for resistance indicated the level of heterozygocity for the resistant genes within selected resistant single mother plants. Since the single plants selected for the two trials were from F7 and/or F8 generation, this kind of segregation, for PRR resistance and for the pigmentation pattern (Table 1), was not expected at this generation, if resistance was controlled by single gene. The above level of heterozygocity within the seeds used was inherent for most of the test entries in the 5 × 5 and 7 × 7 field trials. This clearly indicated that large number of genes were involved in regulating root rot resistance and PRR resistance can be recognised as quantitative in nature. If the PRR resistance was controlled by a single gene, homozygosity could have achieved in F4 generation. The single seed descents selection, single plant selection and pedigree selection techniques in self-pollinated plants attain homozygosity in few generations, for the character of interest that was controlled by single or few genes. Usually in this kind of selection, homogeneity achieved faster in few generations than other selection techniques like mass selection or whole plot selection. Du et al. (2013) after using a most virulent strain to screen for PRR resistance, reported that none of the chickpea lines developed from the inter-species crosses had high level of resistance. Such polygenic resistance mechanism was seen by the chickpea breeders, when they could develop only moderately resistant varieties (Knights et al. 2008). It appeared that the “moderately resistant varieties” had a heterozygotic and heterogenic component for resistance. Another point to consider was the genetic differences of virulence that might have existed among the strains of pathogens used (Du et al. 2013). This might have added some level of differential pathogenicity due to competition among the nine strains. Single plant selection followed by repeated screening or single back cross-followed by single plant selection and repeated screening might help to achieve true or complete resistance. The screening techniques could also be modified to detect or to eliminate the interactive effects of differential pathogenicity of PRR strains. The plot yield was significant (P < 0.05) in both experiments (Appendix 2a and 4a). This was a clear image of the higher variability within and between entries (genotypes) or plots, which was higher than the field (environmental) variability. This indicated a polygenic resistance mechanism was acting among the genotypes tested. Polygenic resistance mechanisms were reported for chickpea Fusarium wilt (Upadhyaya et al. 1983) and other crops (Götesson et al. 2002; Narayanan et al. 2009; Li et al. 2010). If many genes were involved in imparting resistance to PRR, selections should be made from very advanced generations (Falconer et al. 1996), otherwise both resistant and susceptible components would get progressed in the absence of a selection pressure. A selection pressure is essential at every step when developing resistant varieties. It is a well-accepted fact that genetic uniformity of final product is crucial in every crop production, processing and marketing steps of an agriculture or horticultural system. The concerns of lower rhizobial colonization of PRR resistant varieties and reliance of N and P from soil (Plett et al. 2016) need more elaborate agronomic research. As there wee many diverse species (> 100 spp.) of rhizobia (Marta et al. 2014; Dekkiche et al. 2017) and the results of a study was inadequate to generalise rhizobial infection pattern. However, considering an approach to take account and understand the nodulation pattern of wild and cultivated varieties would, not only give insight into disease resistance but also give valuable information for breeder on drought tolerance, yield stability and climate change adaptation pattern. When to select for a character, without genetic studies, was one of the bottlenecks breeders face during initial stages of a breeding program. The 12.5% of heterozygocity at F4 (Falconer et al. 1996) may involve about 93 million base pairs of chickpea DNA sequences (Jain et al. 2013). Since very few genes in chickpea control the favourable traits like seed size, it was possible to attain a high level of homogeneity for seed characters at an early stage of a breeding program. However, it is widely accepted by quantitative geneticists that if many genes control a specific trait, selection need to be done from very advanced generations, depending on the number of genes (Falconer et al. 1996), involved in determining the trait. The polygenic resistance as mentioned above and the findings on the mechanism of infection, Götesson et al. (2002), Narayanan et al. (2009) and Li et al. (2010), clearly indicated that breeding for resistance against this pathogen require more rigorous approaches. The use of molecular methods, such as qPCR may be used to increase the reliability of the results. Single plant selection increased plot yield and resistance when compared to the regular checks as demonstrated here (Figs. 4, 5 and Tables 3, 4). If more cycles of single plant selection followed by disease screening is practised, the homozygous plants for resistance can be isolated. True resistance can be achieved for a crop disease as demonstrated by Haji-Allahverdipoor et al. (2011), Shaikh et al. (2013) and Hanson et al. (2016) in chickpea, lentils and tomato, respectively. The author thankfully acknowledges the contributions of Ms Kelly Purnell, Mr Kristopher King, Mr William Martin, Mr Allan Lisle, Dr Rex Williams, Dr Kevin Moore, Dr Mingzhu Sun, Dr Kevin Moore, Michel Long and Dr Ian Delacy for their assistance in various ways. Thanks to Grain Research and Development Corporation, Department of Primary Industries NSW and Department of Agriculture and Forestry, Queensland for funding National Chickpea Multi Environment Trials. Randomization for replications 1 (R1) and 2 (R2) and heat map for seed yield (g) per plot for single plant bulk trials in 5 × 5 Alpha Lattice Design with two replications (Fig. 3). 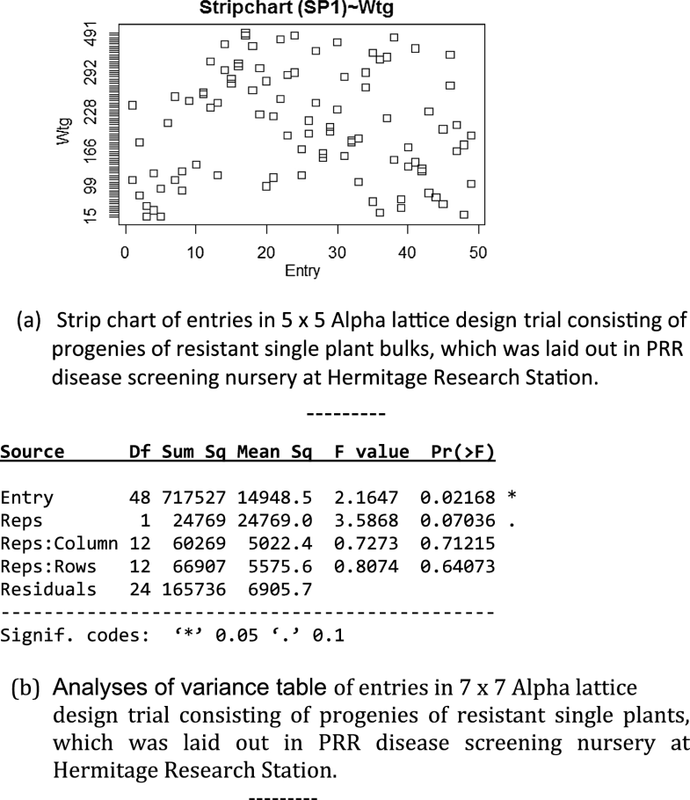 Strip chart (a) and ANOVA (b) for seed yield per plot (g) of Alpha 5 × 5 lattice trial laid out in PRR disease screening nursery. 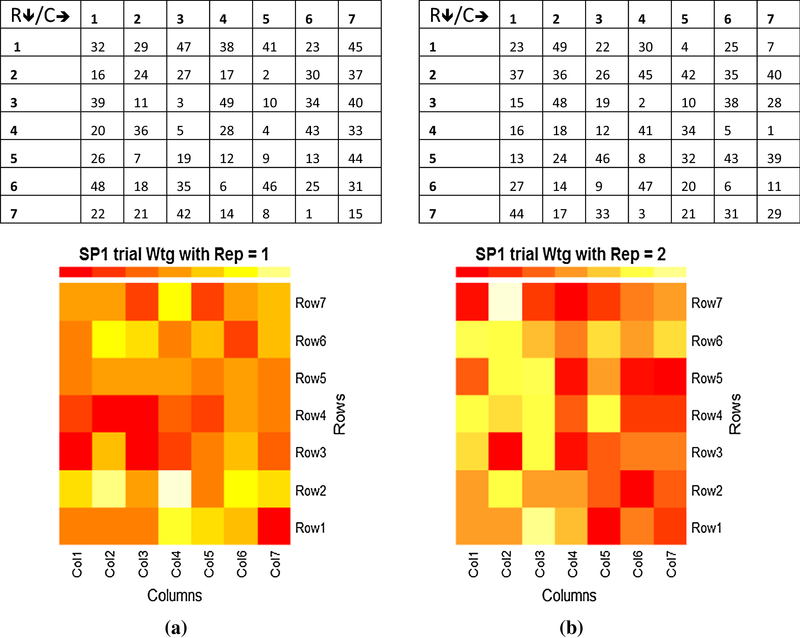 Randomization for replications 1 (R1) and 2 (R2) and heat map for seed yield (g) per plot for single plant trials in 7 × 7 Alpha Lattice Design with two replications (Fig. 4). 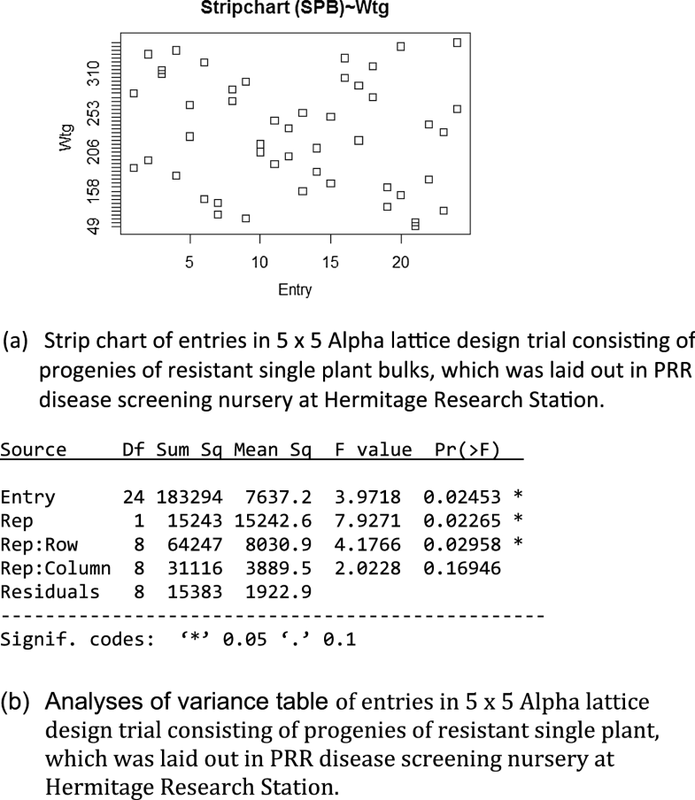 Stripcahrt (a) and ANOVA (b) for seed yield (g) for 7 × 7 Alpha lattice trial laid out in PRR disease screening nursery (Fig. 5).